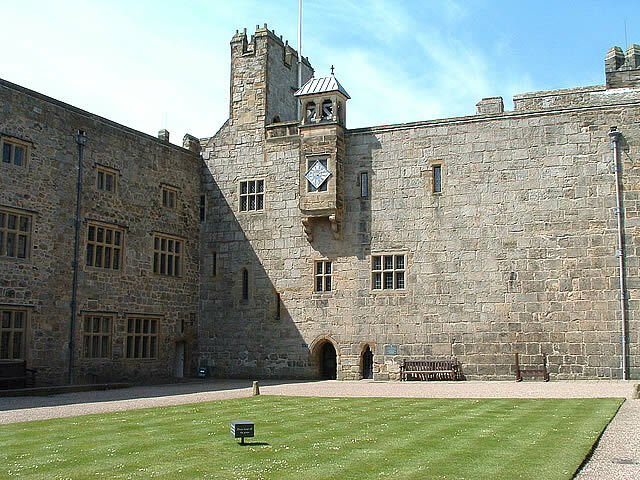 Chirk was never planned as a family home. When first constructed it was a military fortress, important enough for King Edward I to pay a personal visit during its construction in 1295. The King gave Roger Mortimer the Chirklands, suggested his own master-builder James of St. George (the builder of Harlech, Beaumaris, Caernarfon and Conwy castles) and may have even lent Roger Mortimer to money to build the castle. The location of Chirk Castle was carefully chosen to maximise its defensive capabilities. Constructed on a rocky escarpment at the head of the Ceiriog valley, the castle was also able to control the neighbouring Dee Valley and trade along the border. The courtyard well is 28.5 metres deep, but with only 300mm of water in the bottom could probably only support a garrison of 20-30 men. However, clever defences made up for the lack of manpower. Chirk Castle had the most up-to-date defences for the time, with round 'drum' towers that allowed archers a wide firing field and created a 'killing zone' where the fields of fire overlapped. Wider at ground level, the towers, with their 5 metre thick walls, were deliberately designed to splay outwards - making it difficult for siege towers and battering rams to get close. Originally, the castle consisted of four corner towers joined by a narrow curtain wall, with half-towers in the middle of each side. The towers had connecting passageways on the upper floors only, meaning each individual tower would have to be fought over and taken separately by attackers. Originally the narrow curtain walls would have been too narrow to be used as anything other than a passageway, so the inhabitants would live within the towers. The internal design of the towers was carefully planned: entrance ways have hidden 'murder holes' and barricade points. Murder holes (many sneakily hidden) enabled the men inside to drop stones or fire arrows down on surprised invaders. These holes were on every floor so the fight to the top of each tower would have been difficult and deadly. Murder holes are still visible in the Adam Tower, watch out for them when you visit! Chirk Castle stood out prominently in the treeless landscape, especially looking from Wales, and it's highly likely that it would have been lime washed white. The watch towers allowed lookouts to keep a strategic eye on the Welsh hills and valleys. The castle was a symbol of English power and might, controlling the border and it dominated the surrounding land. Some strong earldoms along the Welsh border were granted the privileged status of county palatine shortly after the Norman Conquest, but only that based on Chester survived for a long period. The term Marcher Lord particularly applies to Anglo-Norman lords in Wales, who had complete jurisdiction over their subjects, without recourse to the king of England. The king had jurisdiction only in treason cases, though the lords each bore personal allegiance to the king as feudal subjects. The Welsh Marches contain Britain's densest concentration of motte-and-bailey castles. After the Norman Conquest, William the Conqueror set out to subdue the Welsh, a process that took a century and was never permanently effective. During those generations the Marches were a frontier society in every sense, and a stamp was set on the region that lasted into the time of the Industrial Revolution. Amid violence and dangers, a chronic lack of manpower afforded opportunities for the intrepid, and the Marcher Lords encouraged immigration from all the Norman-Angevin realms, and encouraged trade from their "fair haven" ports like Cardiff. At the top of this culturally diverse, intensely feudalised and local society, the Marcher barons combined the authority of feudal baron and vassal of the King among their Normans, and of supplanting the traditional tywysog among their conquered Welsh. The Anglo-Norman lordships in this area were distinct in several ways: they were geographically compact and jurisdictionally separate one from another, and they had special privileges which separated them from the usual English lordships. Royal writ did not obtain in the Marches: Marcher lords ruled their lands by their own law—sicut regale ("like a king") as Gilbert, Earl of Gloucester, stated, whereas in England fief-holders were directly accountable to the king. Marcher lords could build castles, a jealously guarded and easily revoked Royal privilege in England. Marcher lords administered laws, waged war, established markets in towns, and maintained their own chanceries that kept their records (which have been completely lost). They had their own deputies, or sheriffs. Sitting in their own courts they had jurisdiction over all cases at law save high treason. "They could establish forests and forest laws, declare and wage war, establish boroughs, and grant extensive charters of liberties. They could confiscate the estates of traitors and felons, and regrant these at will. They could establish and preside over their own petty parliaments and county courts. Finally, they could claim any and every feudal due, aid, grant, and relief", although they did not mint coins. Their one insecurity, if they did not take up arms against the king, was of dying without a legitimate heir, whereupon the title reverted to the Crown in escheat. Welsh law was frequently used in the Marches in preference to English law, and there would sometimes be a dispute as to which code should be used to decide a particular case. Feudal social structures, which were never fully established in England, took root in the Marches, which was not legally part of the realm of England. Settlement was encouraged, as if the lands were desert: Knights were granted their own lands, which they held in feudal service to the Norman lords. Settlement was also encouraged in towns that were given market privileges, under the protection of a Norman keep. Peasants came to Wales in large numbers: Henry I encouraged Bretons, Flemings, Normans, and English settlers to move into the south of Wales. The tendencies of innovations in the Plantagenet monarchy were towards a centralised bureaucracy and judiciary, with the gradual elimination of localisms. In the Marches of Wales these processes towards a "high medieval" authority were staunchly resisted. Protests of the border lords surviving in the Royal records throw some light upon the nature and extent of the privileges whose normal operation has left no record. On the local side, the able-bodied population was more directly essential to the local Lord and was able to extract from him carefully defined and highly local liberties. A point of friction was in the Lords' funded churches where they appointed churchmen to livings held tightly under hierarchic control in the manner that had developed in Normandy, where a highly organised church structure was well in the hands of the Duke. The Welsh church, on the Celtic plan, closely connected with clan loyalties, brooked little authoritarian influence. The Marcher Lords were progressively tied to the English kings by the grants of lands and lordships in England, where control was stricter, and where many marcher lords spent most of their time, and through the English kings' dynastic alliances with the great magnates. It was less easy to work in the opposite way, and establish a position among the hereditary marcher families, as Hugh Le Despenser discovered. He began by exchanging estates he held in England and by obtaining grants in the Welsh Marches from the King. He even obtained the Isle of Lundy. When the last male heir of the de Braose family died, Despenser was able to obtain the de Braose lands around Swansea. In 1321 the Marcher Lords threatened to start a civil war and it was agreed that a Parliament should be called to settle the matter. While fierce hostility between the Marcher lords and the Welsh was a fact of life, nevertheless, much intermarriage occurred between the Norman-descended barons and princely Welsh families, (often as a means of cementing a local agreement or alliance). The Mortimers, de Braoses, de Lacys, Grey de Ruthyns, Talbots, and the Le Strange families eventually acquired much Welsh blood through politically advantageous marriages with the Welsh nobility. Roger Mortimer, 1st Baron Mortimer (1231–1282) was a son of Gwladys Ddu, daughter of Llewelyn the Great of Gwynedd. Matilda de Braose, a granddaughter of William de Braose, 4th Lord of Bramber, married a Welsh prince. He was Rhys Mechyll, Prince of Deheubarth. 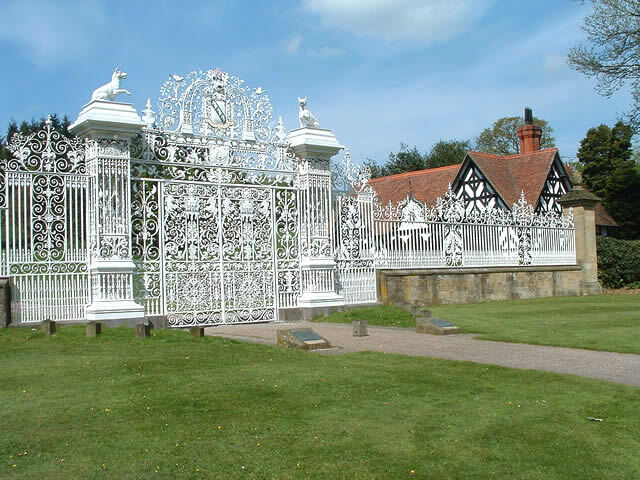 Their daughter Gwenllian married Gilbert Talbot, progenitor of the Earls of Shrewsbury. William de Braose was himself a descendant of Nesta verch Osborne of Wales through his mother Bertha of Hereford. Another member of the de Braose family, Isabella, daughter of Gwilym Ddu or Black William and Eva Marshal married Prince Dafydd ap Llywelyn, whose mother Joan was an illegitimate daughter of King John of England. Queen consort Anne Boleyn descended directly from Gruffydd II ap Madog, Lord of Dinas Bran through his daughter, Angharad who married William Le Boteler of Wem, Shropshire. There is Mobility parking for blue badge holders. The free car park is 40m from the ticket office and visitor centre. Entrance to castle and gardens is 180m up a steep hill. A courtesy coach may be running - please call for availability. Adapted toilet at visitor centre and castle courtyard. Accessible toilets are located at Home Farm, next to the shop, and in the castle courtyard. Please note that due to a step wheelchair access to the accessible toilet at Home Farm is via the shop, please ask a member of staff in the shop. There is no lift to upper floors - wheelchair access to lower East Wing rooms only. Grounds - three wheelchairs available, booking advisable. Access to the top room of the laundries is via a flat path. The laundries have tiled floors throughout which may be uneven. Access to the lower room of the laundries is via a ramp that may be slippery when wet. Assistance dogs are welcome. Tours of the State Rooms are available.